To Cite: Soleyman M R, Khalili M, Khansarinejad B, Baazm M. High-level Expression and Purification of Active Human FGF-2 in Escherichia coli by Codon and Culture Condition Optimization, Iran Red Crescent Med J. 2016 ; 18(2):e21615. doi: 10.5812/ircmj.21615. Background: Basic fibroblast growth factor (bFGF) is a member of a highly conserved superfamily of proteins that are involved in cell proliferation, differentiation, and migration. Objectives: The objective of this study was to overexpress and purify the high-level active human bFGF in Escherichia coli (E. coli). Materials and Methods: This experimental study was conducted in the Islamic Republic of Iran. After codon optimization and gene synthesis, the optimized FGF-2 gene was subcloned into plasmid pET-32a. pET32-FGF-2 was transformed into E. coli BL21 for expression. The cultivation parameters were optimized to produce a high yield of FGF-2. Results: The optimal conditions were determined as follows: cultivation at 37°C in TB medium, with 1 mM isopropyl-β-D-thiogalactopyranoside (IPTG), followed by post-induction expression for 6 h. Under the abovementioned conditions, the expression volumetric productivity of FGF-2 reached 1.48 g/L. Conclusions: A fusion tag from the pET32 expression plasmid permits the recovery of the recombinant fusion FGF-2 from E. coli, without affecting its biological activity. Copyright © 2016, Iranian Red Crescent Medical Journal. This is an open-access article distributed under the terms of the Creative Commons Attribution-NonCommercial 4.0 International License (http://creativecommons.org/licenses/by-nc/4.0/) which permits copy and redistribute the material just in noncommercial usages, provided the original work is properly cited. Fibroblast growth factors (FGFs) are a highly conserved superfamily of proteins that contain approximately 22 members in vertebrates. Further, FGFs interact with heparin and extracellular heparan sulfate proteoglycans (HSPGs) facilitating binding into and activation of FGF receptors (FGFRs) (1, 2). Fibroblast growth factor-2 (FGF2), also known as basic FGF (bFGF), is a multifunctional growth factor, found in a variety of embryonic and adult cell types (3). This growth factor acts through its tyrosine kinases receptors and exhibits several functions including the promotion of cell self-renewal, inhibition of cell senesce, cell differentiation and migration, stimulation of wound healing, and angiogenesis (4-6). FGF-2 has been proposed to play an important role in the development and function of multiple organ systems including the lungs, reproductive system, nervous system, skin, eye, hematopoietic system, muscles, bones, and the digestive system (7). In addition, FGF-2 is important for homeostatic functions and tissue regeneration (2, 3). The biological activities of FGF-2 can be used in tissue engineering, clinical application, or stem cell research (8-11). For this purpose, high-level production of the recombinant form of this protein is required. Escherichia coli (E. coli) is the most frequently used prokaryotic expression system for the cost-effective and high-level production of heterologous proteins (12). In the case of the E. coli system, the expression levels of recombinant FGF-2 are typically low owing to the important difference in codon usage between the eukaryotic and the prokaryotic genes that are reflected by the level of cognate amino-acylated tRNAs available for the translation of recombinant proteins (13). It has been reported that the presence of rare codons affects the protein expression levels as well as the mRNA and plasmid stability in E. coli (14). On the other hand, the excessive presence of rare codons in genes leads to ribosome stalling at positions requiring the incorporation of amino acids coupled to minor codon tRNAs, slow translation, and translation errors (15, 16), or even complete inhibition of protein synthesis and cell growth. Some evidences suggest that the removal of codon bias will help to increase the expression levels of eukaryotic genes in E. coli, sometimes by as high as 40 folds (17). On the other hand, the overproduction of a recombinant protein is strongly associated with the culture medium and the experimental condition (18). For this reason, experimental optimization of the available parameters such as the cultivation mode, expression host and vector, medium composition, post induction period, and environmental factors is essential to maximize the productivity of the recombinant FGF-2. The objective of this study is to develop a pET32a-E. coli BL21 (DE3) expression system for FGF-2 production with increased productivity, by eliminating the abovementioned limitation. E. coli host strain TOP10 (Invitrogen, USA) and host strain BL21 (DE3) (Novagen, USA) were used for cloning and gene expression experiments, respectively. In addition, plasmid pET-32a (+) (Novagen, USA) was used for cloning and expression studies. In this experimental study, the gene sequence of encoding FGF-2 from GenBank (GenBank ID: NM-002006.4) equivalent to the protein sequence of FGF-2 [Uniprot/TrEMBLE: P09038] was selected for codon optimization. A synthetic sequence encoding the FGF-2 protein was designed by using the Java codon adaptation tool (JCat) (19). For optimizing the synthetic gene based on the codon preference of E. coli, negatively cis-acting motifs, the rho-independent transcription termination site, and the repeated sequence were omitted. Then, restriction sites EcoRI and BamHI (both from Fermentas, Lithuania) were introduced at the 5' and the 3' ends of the synthetic sequence, respectively. The encoding gene of the target protein was verified by Genescript (NJ. USA) and synthesized by Biomatik (Canada). General DNA manipulations were carried out, as described by Sambrook et al. (20). The pET-32a (+) vector was double digested and dephosphorylated with EcoRI, BamHI, and alkaline phosphatase (Fermentas, Lithuania) to linearize the supercoiled plasmid. pUC57-FGF (pUC57 plasmid harboring the FGF-2 synthetic gene) was used as a template for FGF-2 gene amplification. Amplification of the FGF-2 encoding gene was carried out with the following universal primers (M13-20): 5'-GTAAAACGACGGCCAGT-3' forward and 5'-GGAAACAGCTATGACCATG-3' reverse primers. 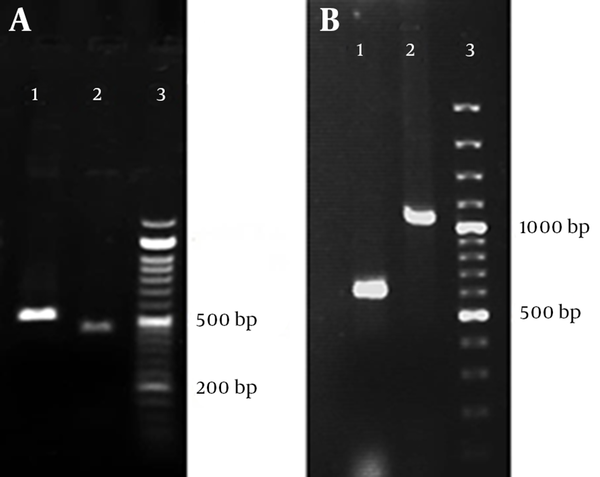 To produce 4444 bp double sticky end for inserted DNA, the polymerase chain reaction (PCR) product was digested with EcoRI and BamHI and analyzed on 1% agarose (CinnaGen, Iran) gel. The linearized plasmid DNA and inserted DNA were purified with a gel extraction kit (Roche, Germany). The ligation of FGF-2 within multicloning sites of pET-32a (+) was carried out using T4 DNA ligase (Fermentas, Lithuania) to construct the expression vector pET-32a-FGF-2. The resulting ligation was transformed into E. coli TOP10 by chemical transformation according to a standard procedure. Then, the recombinant clones were analyzed using the colony PCR utilizing 5'-TCAGTGGTGGTGGTGGTG-3' forward and 5'-GGGAATTGTGAGCGGATAAC-3' reverse primers. The generated transformants were screened with EcoRI and BamHI and then confirmed by DNA sequencing. Finally, the recombinant plasmid was purified from an overnight culture of E. coli TOP10 cells and transformed into E. coli BL21. Productivity of recombinant FGF-2 was evaluated at different incubation temperatures (25°C, 30°C, 37°C, and 42°C) and at four different isopropyl-β-D-thiogalactopyranoside (IPTG) concentrations (0.2, 0.5, 1, and 2 mM). These parameters were individually investigated in the standard shake-flask production. The productivity of FGF-2 was tested using 12% SDS-PAGE gel, 4 h after induction. The optimized temperature and IPTG concentration were used for selecting the best medium. For this purpose, 4 different medium types including lysogeny broth (LB), terrific broth (TB), super optimal broth (SOB), and 2xYT medium were tested. In order to determine the optimal expression time, sodium dodecyl sulfate-polyacrylamide gel electrophoresis (SDS-PAGE) analysis was performed, and samples were collected 2, 4, 6, and 24 hours after induction for each expression flask culture. The culture samples were collected at various time points throughout the shake-flask production and centrifuged (14,000 rpm for 4 minutes). After freezing the pellets at -20°C, they were resuspended in 500 μL TE buffer and 250 μL SDS-PAGE loading solution. After vigorous vortexing, chromatin was disrupted by sonication on ice (5 cycles, 30 second/cycle) using a 2-mm-diameter sonotrode and 100% power input (UP 4005, Hielscher). The suspensions were centrifuged (at 14,000 rpm for 25 minutes), and the supernatant loaded on 12% SDS-PAGE gels and protein bands were observed by Coomassie brilliant blue staining. Volumetric productivities (mg FGF-2/L production culture) were estimated by densitometric analysis of digital images with Image-J software (National Institute of Health, USA). Standard amounts of BSA were run under similar conditions and used as standard. The total protein concentration was determined with a Bradford assay (using BSA as a standard) (21). His-tagged FGF-2 fusion protein was purified by Ni-affinity chromatography as per the manufacturer’s protocol (Qiagen, USA). Briefly, the frozen cell pellets were resuspended in 10 mL of buffer B and disrupted by ultrasonication (3 cycles, 13 minute/cycle) on ice. After centrifugation at 13,200 rpm for 35 minutes at 4°C, clear supernatants were applied to the Ni–NTA resin columns previously equilibrated with buffer A. The columns were washed three times with buffer C, and the bound recombinant proteins were eluted with buffer D. The elute fractions containing the pure fusion protein was dialyzed overnight at 37°C against phosphate-buffered saline (PBS; pH = 7.4). The purity of the recombinant protein was conﬁrmed by the SDS-PAGE analysis. Whole cells, as protein samples, were mixed with the SDS-PAGE loading buffer and heated at 95°C for 5 minutes. The samples were separated using 12% reduced SDS-PAGE gel and electro-transferred (wet western-blot transfer) to a PVDF membrane using the transfer buffer. The membrane was blocked with 2% (w/v) bovine serum albumin (BSA; Sigma, Germany) PBS and 0.05 Tween 20 (Sigma, Germany) and reacted with mice anti-His-tag IgG conjugated with horse radish peroxidase (HRP; Sigma, Germany) for 1 hour at room temperature. After the protein bands were washed, they were developed by adding 3, 3-diaminobenzidine-tetrahydrochloride-dihydrate (DAB; Sigma, Germany). The chromogenic reaction was terminated by rinsing the membrane with distilled water. NIH-3T3 fibroblast cells were seeded in a 96-well plate (6 × 103 cell/well) in Dulbecco’s modified Eagle’s medium (DMEM; Invitrogen, USA) supplemented with 10% fetal bovine serum (FBS; Invitrogen, USA). After 24 h, this medium was replaced with fresh DMEM containing various concentrations (0.001, 0.1, 1, and 10 ng/mL) of either fusion recombinant bFGF (Trx-FGF-2) or commercial bFGF (Sigma, Germany). After 48 hours, methylthiazo tetrazolium (MTT) assay was performed to evaluate the cell activity. Briefly, after removing the medium, the cells were washed with PBS, and 5 mg/mL MTT was added to each sample. After 4 hours, the medium and MTT were replaced by 100 mL of dimethylsulfoxide (DMSO; Sigma, Germany). The plate was kept at room temperature for 30 minutes, and then, the optical density (OD) at 570 nm was measured using a microplate reader. In this study, the human FGF-2-gene-based E. coli preferred codons obtained by JCat, which improve the codon adaptation index (CAI) from 0.21 for the FGF-2 wild type to 1.0 in the optimized form (Figure 1A). Moreover, analysis for the G/C content indicated a similar GC content in the optimized form (~ 50%); however, the G/C distribution appears more homogeneous than FGF-2 wild type (Figure 1B). The sequence alignment showed that the optimized FGF-2 gene had 78.08 % of identity with respect to the wild-type gene, as well as predicted that the amino acid sequences of these two genes were absolutely identical (Figure 1C). The mean codon usage of E. coli is represented as a blue line. A, the gray lines above and below the mean codon usage denote the standard deviation of codon; B, The GC content analysis of the FGF-2 wild type and the optimized FGF-2 gene; C, Sequence comparison between the original and the optimized FGF-2 genes. The FGF-2 synthetic gene was amplified by the PCR from pUC57, and after it was digested, it was ligated into the pET32a (+) vector. The expression vector pET32a-FGF2 was constructed successfully (Figure 2). The FGF-2 gene was fused with the 109 amino acid TrxA. Tag under the control of T7 promoter (Figure 3). A, Lane 1, 530 bp PCR product of the FGF-2 gene; lane 2,444 bp double digested insertion fragment; lane 3, 50 bp DNA ladder; B, Lane 1, 626 bp product of the colony PCR pET-32 without the FGF-2 inserts; lane 2, 1064 bp gene product of the colony PCR of the FGF-2 gene ligated in pET-32; lane3, 100 bp DNA ladder. Temperature is one of the important parameters associated with the recombinant protein expression (22). To investigate the effect of temperature on the FGF-2 expression, BL21 /pET32-FGF-2 was cultivated in a standard culture and incubated at 25, 30, 37, and 42°C, and the expression level of the product was analyzed by SDS-PAGE. Our results revealed that a relatively high protein expression was obtained at 37°C because the addition of IPTG triggers the foreign protein expression in the plasmid. Therefore, in this study, different IPTG concentrations were examined, and the expression level of the product was analyzed by SDS-PAGE. Our results showed that at 1 mM, the highest expression level of fusion was achieved and further experiments were performed under this concentration. Recombinant E. coli BL21 cells were cultured in four different media at 37°C and 1 mM IPTG. When OD 600 of the culture reached 0.6, the optimal post-induction time was obtained by analyzing the collected samples (Figure 4A - D). The highest concentration of cell growth of approximately ~1.48 g/L was achieved 6 h after induction in the TB medium (Table 1). Lane 1: before induction, Lane 2: 2 hours, lane 3: 4 hours, lane 4: 6 hours, and lane 5: 24 hours after induction. A, LB; B, 2xYT; C, TB; and D, SOB media. aProtein product amount (gram protein per liter cell culture) based on the densitometric analysis of the expressed protein. Fusion FGF-2 was purified by Ni-affinity chromatography under the denaturation condition, and the affinity-purified proteins were analyzed by SDS-PAGE and Western blotting. SDS-PAGE analysis revealed the presence of an ~36.5 kDa recombinant protein as a specific band in the eluted fraction (Figure 5A). 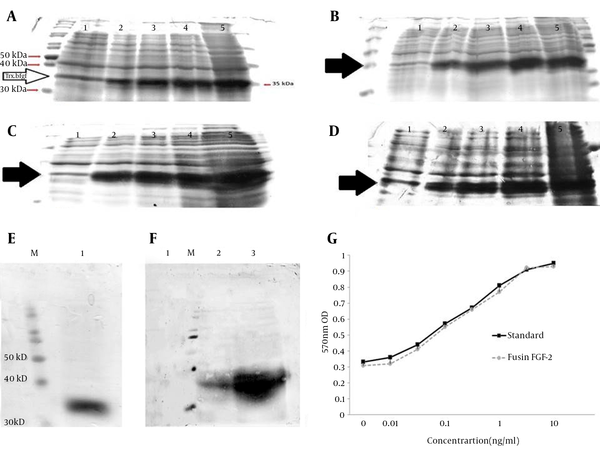 Western blot analysis showed the expression of the recombinant FGF-2 protein before and after 6 h of induction (Figure 5B). A, M, protein molecular weight standard and lane 1, purified FGF-2; B, western blotting of recombinant FGF-2; lane1, BL21/pET-32a (negative control); lane 2, BL21/PET-FGF-2 before induction; lane3, BL21 (DE3)/PET-FGF-2 4 hours after induction; C, MTT assay of standard FGF-2 and fusion FGF-2. The biological activity of FGF-2 was determined by its ability to stimulate the proliferation of NIH-3T3 fibroblast cell lines. Our data showed that the Trx-FGF-2 fusion protein was capable of stimulating the proliferation of the NIH-3T3 cells as well as the commercial FGF-2 (standard) in a dose-dependent manner (Figure 5C). Basic FGF, a mitogenic polypeptide, was originally identified from the bovine brain and pituitary gland (23). Owing to limited source availability, difficulty in isolation, and demand for large amounts of bFGF, high-level expression and purification of this growth factor are required for different applications such as tissue regeneration, wound healing, and stem cell research (24-26). For producing a recombinant bFGF, various hosts such as E. coli, bacillus subtilis, pichia pastoris, soybean seeds, silkworm (bombyx mori L), and rice seeds have been used (27-30). In this study, an E. coli expression system was used for the over production of the FGF-2 recombinant protein. This system offers several advantages when expressing a heterologous recombinant protein, including cost effectiveness, time saving, easy culture, fast growth, and easy recovery of the recombinant protein (31). Some studies showed that using an E. coli expression system is associated with the low yield of the bFGF. An important factor that limits the high-level expression is possibly the extreme differences in the codon composition between the human and the E. coli genes (32). To solve this problem, the FGF-2 gene sequence was initially redesigned by completely replacing the less frequently used codons in E. coli by the corresponding preferred codons (17), this manipulation could upgrade the codon adaptation index (CAI) from 0.21 to 1.0 with homogeneous G/C distribution. In a codon-optimized synthetic gene sequence, a total of 84 codons (57%) were replaced. Another factor associated with low productivity is the formation of an inclusion body (33). In this regard, a thioredoxin tag was co-expressed in the pET32a (+) expression vector system to increase the solubility of FGF-2 and to prevent the formation of inclusion bodies. Between the Trx.Tag and the FGF-2 coding sequence, a 6 His-tag residue was used for detection and fast puriﬁcation by affinity chromatography. The fusion protein length id 335aa with a theoretical molecular weight of 36.78 kDa and pI: 8.51 has been calculated using the ProtParam tool (http://web.expasy.org/protparam). 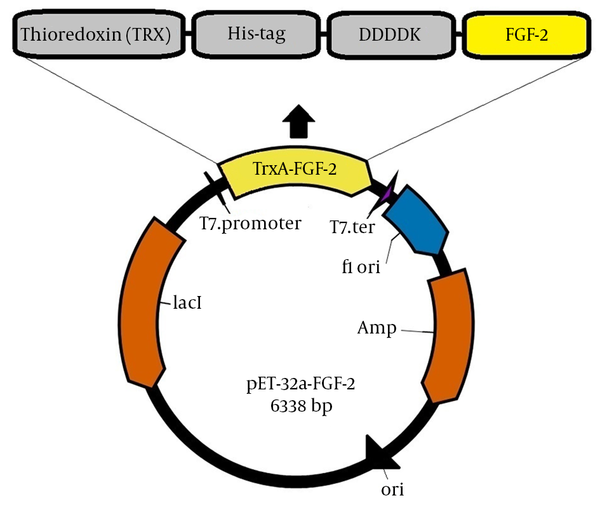 The enterokinase cleavage site (DDDDK), which segregates the Trx and the FGF-2 protein, permitted the recovery of the FGF-2 protein from the fusion protein through enterokinase digestion. This expression system was used to successfully purify the fusion FGF-2 protein by affinity chromatography. The SDS-PAGE analysis and western blotting showed a major band corresponding to FGF-2, with a molecular weight of 36.5 kDa. On the other hand, volumetric production was also promoted by optimizing the medium composition and induction condition (34). Thus, the IPTG concentration, incubation temperature, medium composition, and the induction time were investigated. The results of this study showed that an optimum expression was obtained at 37°C and at 1 mM IPTG concentration. All further studies were conducted under these conditions. In addition, four different media and different expression times were examined. The present study showed that the TB and the SOB are suitable media for overexpressing FGF-2 under an optimized condition. However, the expression yield of FGF-2 in TB was greater than that in the SOB medium. It appears that not only the high amount of yeast extract, tryptone, peptone, and phosphates of the TB medium enables high productivity but also the use of glycerol as the carbon source supplement and a phosphate buffer reduces unfavorable pH changes (35). After the systematic optimization of the expression conditions, the highest volumetric productivity of the FGF-2 fusion protein (~ 1.48 g/L) was achieved when BL21 (DE3)/pET32-FGF-2 was cultured in the TB medium and induced at the mid-log phase (OD = 0.6) with 1 mM IPTG for 6 h at 37°C. Previous experiments have shown that the direct expression of FGF-2 yields approximately 1 - 10 mg of protein per liter of cell culture, and after the manipulation of the preparation condition, the yield of FGF-2 was 1 g of protein per liter of cell culture (36). In this study, however, an increased expression of FGF-2 in E. coli was achieved. The effect of the Trx-FGF-2 fusion protein on the NIH-3T3 fibroblast cell proliferation showed that Trx-Tag did not exert negative effects on the bioactivity of FGF-2 and that tag removal is not necessary for increasing the function of the recombinant proteins. In summary, the present study indicates that the human FGF-2 protein could be expressed functionally in E. coli by fusing it with thioredoxin. The highest productivity of FGF-2 was achieved (~ 1.48 g/L) after the systematic optimization of the expression conditions. The abovementioned strategy is likely to be helpful for the production of biologically active human bFGF. This study emanated from a proposal (No. 904) approved and supported by the Arak University of Medical Sciences (ethical code92-146-11 and date of ethical approval 20.5.2013). The authors would like to thank Dr. H. Abtahi for many helpful comments on this work. Authors’ Contribution: Mohammad Reza Soleyman and Mostafa Khalili did the experimental procedures; Behzad Khansarinejad and Maryam Baazm supervised the project.